This is Halite, also known as table salt. It was formed when ancient seas dried up, leaving layers of salt behind. What kind of rock is it?. No. Igneous rocks formed from magma or lava. The Halite was not melted, and is not an igneous rock. Yes! Sedimentary rocks are deposited by wind, water, ice, or gravity, and they often contain fossils. Halite was deposited in large layers by water, which means that it is a sedimentary rock. 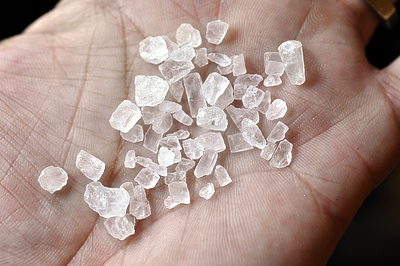 Halite is also a mineral, and is one of the few rocks/minerals that we eat. No. Metamorphic rocks have been changed by heat and pressure from a different kind of rock. It is not metamorphic. Halite is not a rock. No. Halite is a naturally occurring solid that forms large layers in the Earth. Halite is a rock.